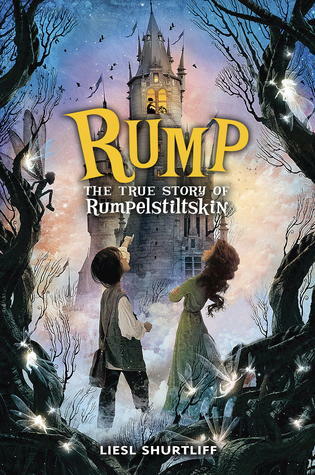 Rump is the “true” story of the character Rumplestiltskin (of fairytale fame). I often use this fairy tale when teaching theatre and am surprised that only about 60% of my students (elementary thru high school age) are familiar with the original story. In the original fairy tale Rumplestiltskin is an odd little man who seems to appear in the nick of time to help a maiden in distress, only to have that “help” take an evil turn. A greedy miller boasts to the King that his daughter can spin straw into gold (when she truly has no idea how to even go about attempting such an impossible task). The King has the daughter brought to his palace, locks her in a room full of straw and orders her to spin it all into straw before morning or she will be killed (because her father lied). At a loss, the daughter begins weeping and Rumplestiltskin appears, offering to spin the straw to gold for her if she will give him something valuable in return. She agrees and gives him her necklace. In the morning the King is still unsatisfied and repeats the task and conditions a second night. The daughter pays Rumplestiltskin for his services with a ring. The third night the King tells the daughter that if she spins the straw into gold the this time she will become his wife (if she fails, she still dies). When Rumplestiltskin arrives on the third night the young woman has no valuables left to give him. Rumplestiltskin offers her a deal: he will spin the straw for her promise that she will give him her firstborn child after she and the King are married. She agrees. He spins the straw. The daughter becomes the Queen and soon has a son. Rumplestiltskin returns to claim the child he has been promised but the Queen begs for a way out of the agreement. Rumplestiltskin tells her that if she can guess his name within three days he will give up his right to the baby and go away. In the fairytale the Queen IS able to guess his name and keep her child and Rumplestiltskin meets various ends depending on which version of the tale you read. Liesl Shurtliff has taken the character of Rumplestiltskin and made him a young, likeable boy struggling to create his OWN path in the world. Ms Shurtliff crafts a modern story about growing up, discovering what is special about yourself and how to embrace that as you choose how you want to be in this world. And she throws in enough humor to make Rump’s journey an easy one to follow. For those–like me–who always appreciate an original twist on a fairytale theme, story or character Rump is an excellent reading choice. My children and I read this one a year ago as one of our bedtime reading choices and both–a 5th and a 6th grader–enjoyed the story and have recommended it to friends. Personally, I thought the pacing of the story was a little uneven, alternating between long, boring chapters and faster-moving, more detailed, action-oriented ones. It did not seem to bother the kids, though.